If u were like me and want to get started on making station's & buying ships well you are in the right spot. So here is a few steps to get you on the way to a Glory & Profit's $$$. * Get onto the Game. * Go to in game settings. * Go to Game Options. * Make sure Compress Save is Off. * Open your Folder/File Explorer. * Click on EgoSoft -> X4 -> # File -> Save File. * Right Click on any of you save files you want to edit. * If u have WinRar or 7-Zip. * Right Click to extract File / I extracted it into the save file faster way X3. * Right Click on the Exracted File then Use Notepad++ to open file. * Then on Top Left area Find Search then left-click it then hit FIND. back to game load that Save File u edit and happy Shopping everyone. Stuff a new player has figured out along the way. both want to remember for myself, and figured might help some other people. * To access the in-game Tutorials, hit H. Do the tutorials, seriously. buildings at the docks with a large shopping cart hologram above them. You can buy crafting items from them, such as needles and bandages, and craft medkits. This turns a really good profit, at least for me as I start out. * There's a sort of interplanetary superhighway - these long blue ribbons you can kind of see on the map, and in space. If you fly near one, then lower yourself down (using the s key), you can lock onto it and race around at very high speed. This is awesome. It's possible to speed up slightly with x and slow down a bit with Z, so you can overtake traffic. * Manually docking the first time was confusing as hell. Not only must you follow the easy to see green lines to the docking zone, you need to line yourself up with your pad. This is best done by looking for a hologram. You need to roll (tilt side to side with q and e), align the front of your starship (hold mouse1 and turn to face), and get yourself lined up with the centre of the pad (z and x to put throttle backward and forward, or mousewheel also works), then hit s to go down and land. * Sometimes you will overhear police radio type stuff. If a tiny ship gets marked as an enemy, for whatever reason, it seems to be safe to shoot it. You get a small bounty and a small boost to relations with the local faction. * I think I found some space landmines! They showed up on longscan as a field of ?s, and when I got close I couldn't target them. But by running into them my ship exploded. They looked like yellow glows which I was hoping were some kind of valuable space mystery. out for purple pings in the world (not on the map) which are invisible to radar. to, then right click it and click 'select' in the popup menu. You can then assign them a role in the right hand hire dialogue menu. * To sell a ship, Open the map then select the ship you want to sell, then right click on a shipyard or warf and select sell ship in the drop down. In X4 Foundations you can use a custom logo that will be shown on your ships. This guide describes the process of getting your images to show up in game. Valid file formats are .BMP, .DDS, .GIF, .JPG, .PNG and .TGA. For the [Numbers] folder to be generated you will need at least one save-game, so the first step is to save your game at least once. After that, create the logos directory inside of the [Numbers] folder. The images you place inside the logos folder must be square and a power of two. A valid size would be 128x128, 256x256,512x512, ... and so on. ENTER, click the tab Player Information and then scroll down to Custom Logos. Data Vaults are located in space and show up as a purple ping when using the Lon-rang scanner. So far I have only seen them in Asteroid fields so you can focus on those areas to start with. Once You have a ping just fly toward it till you find the Vault. In order to get the data out of the vault you need to get the vault back online. To do this first get your ship close to the vault than get out of your ship. You will need a repair laser for this part. Look for panels that are lit up in red and say presser leak detected(see first image). Just get close enough to hit it with your laser to fix it. It will turn green and say status ok(see second image). Some of these will make the solar panels align with the sun while others will open small hatches that can contain other panels that need repaired or containers you can pick up. Ones all the panels are repaired one finale hatch will open. Now that the last hatch has opened fly over to it with you scanner going. (Default key-bind is shift+2) You will hear the static on the coms as you get closer to the spot. You will see some broken wires with a red mess of lights above them, just point towards that mess and slowly approach until you get the data. If you do the trade tutorial you will learn how to order your ships to trade manually. You can assign autotrade by right clicking and choose the option. Make sure your cargo hold is empty! Autotraders do not sell stuff already in cargo hold. No room, no trade. Credits due from trade are those that you get after a planned trade is finished. Keep that switch for trade offers in mind! Your spacesuit is very useful! You can go out of your ship in a spacesuit by using the teleporter console of your ship when in space. Unfortunately that does not work on staions. Why unfortunately? Your suit is equipped with a repair laser, that makes repairs possible. After you buy a hand laser, you need to reassign the repair laser to a fire group. * Head to Argon Prime. (noted in red hexagons on the map). * Start at one end and focus on the asteroids. * Notice on some asteroids a bright twinkle? Head towards these twinkles directly. * Shoot directly at the crystal with your primary weapon when in range. (Best not to use ammo based weapons so you gain the most profit of this venture. * Pick up the crystals by holding down the key that activates the device used to pull free floating items into your ships hold. * Purple (Bandannite) - most common, least valuable (850cr - 1,150cr). Stations are constructed from modules which act independently of each other but can be connected together to allow for the efficient transfer of wares between modules without the need for drones or ships. To construct a station module requires the corresponding Blueprint and for the station Build Storage to have enough wares for construction by an assigned Build type ship. * Build: Produce, equip and repair ships. 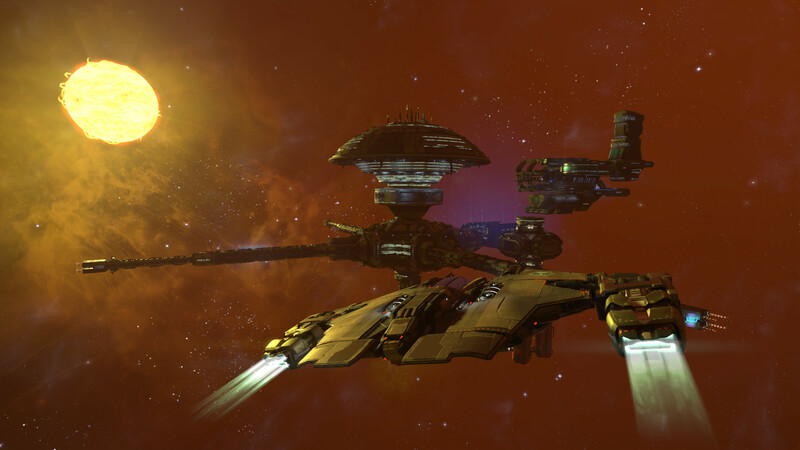 * Defence: Heavily armed modules for protecting the station and claiming ownership of entire sectors. * Dock: Allow ships of various sizes to dock at the station. * Habitation: Houses the station workforce. * Other: Used to connect modules to other modules or act as spacers. * Production: Produces specific wares, usually by consuming other wares. * Storage: Stores wares of the corresponding storage type. * Venture: Special modules with unique functions which are usually the rewards of plots. 1.The ship nose must point in the right direction. 2.The ship must be parallel to the landing pad. 3.The ship must be located centrally over the landing area. 4.The ship must be hovering at a certain height. Flying by stations you sometimes see mission icons appear on the radar. Then open the mission interface (shift M) to see the actual offer. The alternative are secret missions offered through signals revealed with the SCAN MODE (Shift 2). These missions often pay better. around them. To get to that point you have to get good standings with a faction first and follow their invitation. If you have these items in your inventory, you can apply them to a security panel of a station. Panel are found in rooms like the engineering section. The hardest to hack security system is the "Turret Control Panel", as it shuts down almost the entire defence systems of a station. To hack it, you will need a Security Slicer. Most other panel can be hacked with the Security Decryption System. First get a good standing of at least level 10 with at least one of the factions of the game. You can improve your standing with many ways: Playing missions, destroying smuggling drones, help the fight against a factions enemmies or just trade with them. Once you reach level 10 you may get an invitation mission to visit the faction administrative. Talk with him and accept the honour to be promoted. This alone already may unlock some licenses. Others can be bought once your reputation allows it. 1.On any ship you dock with the shipyard of the faction with which you are most friendly for upgrading. 2.Put the most expensive gun / equipment for all the money. 3.Fly to the shipyard of the faction with which you have a near-zero relationship, and again you dock for an upgrade. 4.Sell everything that you bought earlier. You are a beginner and have some stations built, but none make any profits for you? Well, take a look and see if my simple and basic tips can help you maximize your income! * Connection modules, like a cross that goes upwards, as most production modules require these Production Modules, duh. * You can get these blueprints for free when you have completed the according “Research” and flew around the station modules in Scan-Mode waiting and hoping for the data leaks. * It’s not as rare as you think and I can highly recommend this as this can save you over 100 million credits. * Go to your player info menu and then to the “Credit”-Symbol, where you see your station funds. * The station funds “recommended” when hovering over the station name are what the station needs to fill their containers and storage. Fund the station generously to get it going as they buy food and materials. * Always add Energy Cell Production (Solar panels). Expensive at first, but cost effective. * Click on the station on the map: See whether the storage is full – then add more and see whether one of the three different types is full. * Click on the station on the map: See whether there are enough habitats for your workers. The “most efficient amount” of those workers will be reached eventually when enough food is available. * Watch out as every race requires a different type of food. * Where there are many station of a certain race, there will be a lot of need for food – therefore, choose a location close to many stations and lots of (already existing) traffic. * Place close or even in the resource site for easy extraction of materials. * Your own miners fill your storage for free. This reduces your material costs to almost zero. * Do not specialize on a single product, instead: Make a production line! * Do not simply focus on exporting Silicon or Ore. Instead: Build Microchips from the already refined silicon. Even go as far as building Nano technology! Nanotronics, Refined Silicon, Fuel and Food are highly profitable when the production line starts at the most basic material.